This course was published in the February 2017 issue and expires February 2020. The authors have no commercial conflicts of interest to disclose. This 2 credit hour self-study activity is electronically mediated. Identify the classifications for multiple sclerosis (MS). Discuss the diagnosis and treatment of MS. 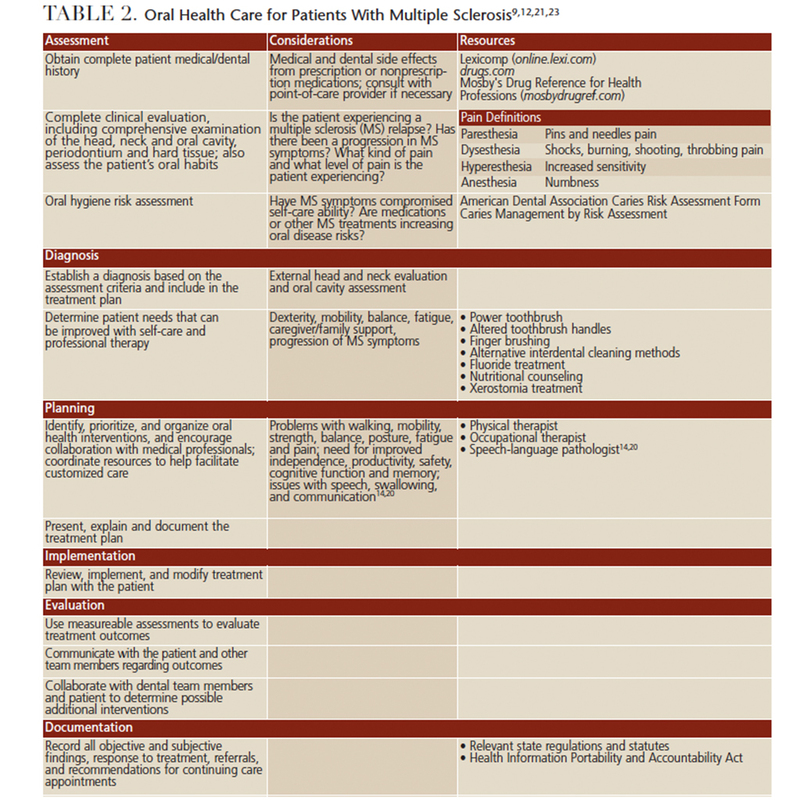 List strategies for helping patients with MS receive professional dental care. Common side effects of MS therapeutic medications include xerostomia, gingival hyperplasia, mucositis/ ulcerative stomatitis, dysgeusia, candidiasis, angular cheilitis, and reactivation of herpes viruses.9,13 If patients are taking immunosuppressants, they may be at increased risk for opportunistic infections and cancers.23 Patients experiencing xerostomia may need saliva substitutes and instruction on how to use these products. 9 Patients with candidiasis and/or angular cheilitis require antifungal medication, while those with herpetic lesions should receive antiviral therapy.23 A complete list of a patient’s possible medical and oral health side effects will help determine which issues need to be addressed by the oral health professional.9 Toward this end, obtaining a patient’s medical and prescription information prior to the appointment is helpful.9 Not only does smoking contribute to the worsening of MS symptoms, it encourages progression from RRMS to PPMS.8 When oral health professionals provide behavioral interventions for tobacco cessation, individuals may be more likely to quit or avoid using tobacco in the first place.24 Dental professionals should be prepared to direct individuals to smoking cessation resources. Patients with MS face an array of oral health risks — not only from loss of dexterity and side effects of medications, but also from cognitive, emotional and social factors. Oral health professionals can create an environment that is conducive to patient needs and provide oral hygiene education that is appropriate for individual health concerns. By understanding the complexity and possible progression of MS symptoms, the dental team can facilitate an environment that encourages individuals with MS to seek appropriate oral health care for a lifetime. Holland NJ, Schneider DM, Rapp R, Kalb RC. Meeting the needs of people with primary progressive multiple sclerosis, their families, and the health-care community. Int J MS Care. 2011;13:65–74. Elemek E, Almas K. Multiple sclerosis and oral health: An update. The Dental Assistant. 2014;83(5):32–39. Hanson KA, Agashivala N, Wyrwich KW, Raimundo K, Kim E, Brandes DW. Treatment selection and experience in multiple sclerosis: survey of neurologists. Patient Prefer Adherence. 2014;8:415. Kelly SB, Fogarty E, Duggan M, et al. Economic costs associated with an MS relapse. Mult Scler Relat Disord. 2014;3:678–683. Toledano M, Weinshenker, BG, Solomon AJ. A clinical approach to the differential diagnosis of multiple sclerosis. Curr Neurol Neurosci Rep. 2015;15:1–57. Hemmer B, Kerschensteiner M, Korn T. Role of the innate and adaptive immune responses in the course of multiple sclerosis. Lancet Neurol. 2015;14:406–419. Wekerle H. Nature plus nurture: the triggering of multiple sclerosis. Swiss Med Wkly. 2014;145:w14189. Briggs FB, Green MC, Ritterman Weintraub ML. Role of socioeconomic position in multiple sclerosis etiology. Neurodegener Dis Manag. 2015;5:333–343. Simmer-Beck M. Providing Evidence-Based Oral Health Care to Individuals Diagnosed With Degenerative Disorders, Part 1: Multiple Sclerosis. Available at: dentalcare.com/enus/ professional-education/cecourses/ ce444/medications-to-modify-thecourse- of-disease. Accessed January 3, 2017. Strober LB. Fatigue in multiple sclerosis: A look at the role of poor sleep. Front Neurol. 2015;6:1–7. Ghasemi M, Gorji Y, Ashtar F, Ghasemi M. A study of psychological well-being in people with multiple sclerosis and their primary caregivers. Adv Biomed Res. 2015;4:49. American Dental Hygienists’ Association. Standards for Clinical Dental Hygiene Practice. Available at: adha.org/resources-docs/2016- Revised-Standards-for-Clinical-Dental-Hygiene- Practice.pdf. Accessed January 3, 2017. National Multiple Sclerosis Society. Medications and Rehabilitation. Available at: nationalmssociety.org/Treating-MS/Medications. Accessed January 3, 2017. WebMD. Drugs & Medications A–Z. Available at: webmd.com/drugs/indexdrugs. aspx. Accessed January 3, 2017. Bogosian A, Chadwick P, Windgassen S, et al. Distress improves after mindfulness training for progressive MS: A pilot randomized trial. Mult Scler. 2015;21:1184–1194. Gich J, Freixanet J, García R, et al. A randomized, controlled, single-blind, 6-month pilot study to evaluate the efficacy of MS-Line! : A cognitive rehabilitation programme for patients with multiple sclerosis. Mult Scler. 2015;21:1332–1343. Steinman L. The reemergence of antigenspecific tolerance as a potential therapy for MS. Mult Scler. 2015;21:1223–1238. Fragoso Y, Stoney P, McCaffery P. The evidence for a beneficial role of vitamin A in multiple sclerosis. CNS Drugs. 2014;28:291–299. Martinkaitytë P, Griðkevièiûtë R, Balnytë R. Stem cell therapy in multiple sclerosis: Current progress and future prospects. Neurologijos Seminarai. 2016;20(2):73–81. Kremer D, Küry P, Dutta R. Promoting remyelination in multiple sclerosis: Current drugs and future prospects. Mult Scler. 2015;21:541–549. Baird WO, McGrother C, Abrams KR, Dugmore C, Jackson RJ. Factors that influence the dental attendance pattern and maintenance of oral health for people with multiple sclerosis. Br Dent J. 2007;202:E4. Santa Eulalia-Troisfontaines E, Martínez- Pérez EM, Miegimolle-Herrero M, Planells-Del Pozo P. Oral health status of a population with multiple sclerosis. Med Oral Patol Oral Cir Bucal. 2012;17:e223–e227. Little JW, Falace DA, Miller CS, Rhodus NL. Little and Falace’s Dental Management of the Medically Compromised Patient. 8th ed. 2013. St. Louis: Elsevier; 516–519. Carr A, Ebbert J. Interventions for tobacco cessation in the dental setting. Cochrane Database Syst Rev. 2012;13:CD005084. From Decisions in Dentistry. February 2017;3(2):40–43. Kelly Schroeder, RDH, MS, practices in Hortonville, Wisconsin. Committed to solving barriers to oral health care, she volunteers at Tri-County Community Dental Clinic and works to bring oral health awareness to rural communities in Wisconsin. She can be reached at schrkell@isu.edu. JoAnn R. Gurenlian, RDH, PhD, is a professor and graduate dental hygiene program director at Idaho State University in Pocatello. She is also immediate past president of the International Federation of Dental Hygiene and the 2015 winner of The Esther Wilkins Lifetime Achievement Award, presented by Decisions in Dentistry’s sister journal, Dimensions of Dental Hygiene.